It was good to meet up with old and new friends and family in April when I came back to the UK for a short break. I have been quite busy since I have been back in Zambia with various groups and college work. I am also very happy to have a visitor from NewMachar Church in Scotland. Moira Lee is a recently retired Mental Health Nurse is with me for 6 weeks. Moira has come for what is very much a working holiday, and to experience Zambian life. On her second day we went far into the bush with the women from Ipusukilo to their maize field to start harvesting the maize. 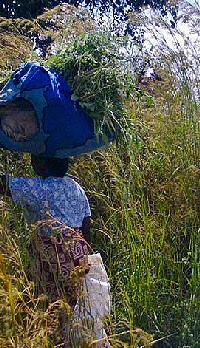 Once picked, the maize is husked and put into sacks which are then carried in hand and on head back to my pick up truck on the dirt road about ½ mile from the field. Then the slow and laborious drive back to Kitwe. As well as this, Moira has also run a training session with home based carers, visited Play4all and the albino community in Kitwe, and accompanied me on the nearly 2,000k trip to Choma. Welcome to Zambia Moira! As I mentioned earlier, we visited a group from the albino community in Chimwemwe, the largest compound in Kitwe. 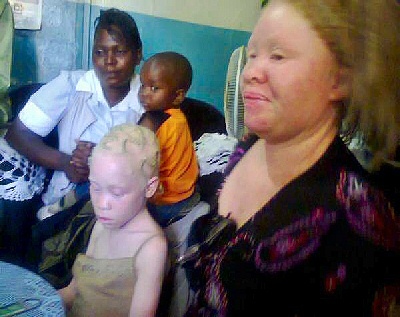 Albinoism (lack of protective pigment in the skin) is a genetic condition and seems to be much more common in Zambia and other African countries than in the UK. The main physical problem for people in Kitwe is the lack of sunscreen. In my 5 years in Kitwe I have only seen sun tan lotion in the shops once, and specialist UV protection for albinos can only be bought in Lusaka for about £60.00 for a months supply. Therefore the people we see often have red sore skin, sometimes with lesions, and the increased risk of skin cancer is very high if they have no UV protection. As people have come over for work experience etc. I have asked them to leave their old suntan lotion behind and passed it on to the albino community, which is how I came to know this group. As well as sun tan lotion, sunglasses, hats and long sleeve clothing are helpful to protect their delicate skin and eyes. Sadly, lack of UV protection is not the only problem they face. Some traditional superstitions and beliefs are also harmful. One belief is that albino’s do not die but just disappear, another is that sharing a meal or close personal contact can turn you into an albino too, whilst these are unpleasant they are not harmful. 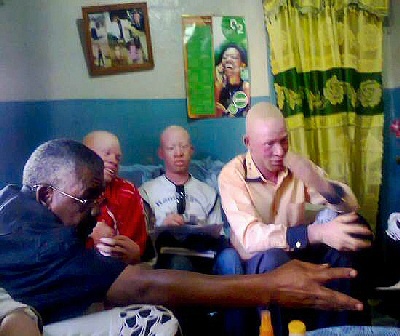 Traditional witch doctors in the neighbouring countries of Tanzania and Rwanda however believe that the body parts of an albino have magical properties, and people pay large fees for a potion with, for example, the arm of an albino, to give them extra strength. When Innocents’ sister died the family found the grave had been opened and her body stolen, because of this, albinos are often buried in secret – hence perpetuating the “disappearing” belief I suppose.. Memory told me that she did not feel safe because she fears people may come from Tanzania to abduct her. Indeed, I have heard several reports on the Africa World Service of abductions and killings in Tanzania and it is not inconceivable that they would travel to Zambia also. 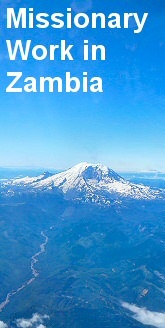 Having said that, many in the local community are supportive, and Zambians can be proud of their peace loving and friendly reputation. For Moira’s visit to Zambia, and the help she has given whilst over here. 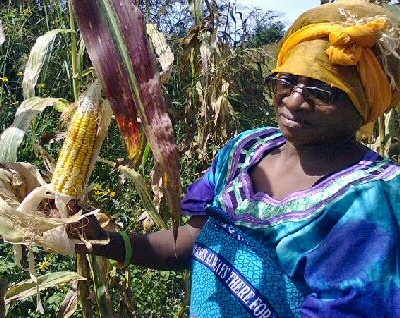 Despite late planting it seems like a good harvest of maize for the women from Ipusukilo. Play4all continues to go well, and we are making links with the UCZ church in Kamatipa. The Theological college graduation ceremony, 6 new ministers and 2 new deacons graduated in May. For Sanah, a Canadian student who will be working with Play4all for 3 months. For practical help for the albino communities in Kitwe, eg a room to hold meetings in. Agnes Zungu, one of the Ipusukilo ladies, has been diagnosed with stomach cancer. My little truck – which is still having major problems! For Gladys and the farm kids as they struggle to make ends meet.